﻿ The Shins should never have been as much of a cult act as they are. Sure, James Mercer’s revolving-door indie-pop project has always been quirky to some extent, but there’s at least something of an accessibility there. Yet the closest they’ve ever come to widespread success was with the very minor hits Phantom Limb in 2006 and Simple Song in 2012, not to mention the fact that a large proportion of the sales of their first two albums came from Natalie Portman’s endorsement in Garden State. But even with the perennial critical adoration he frequently receives, Mercer has tended to save his most pop-leaning tendencies for his infrequent Danger Mouse collaborations with Broken Bells; The Shins often gives off the aura of a passion project rather than anything really vying for mainstream acceptance. As such, Heartworms is Mercer’s latest collection of off-kilter musings packaged together as a dense yet deceptively lightweight collection of alt-pop. It says a lot about The Shins’ artistic abilities that they’re able to fashion such offbeat passages into workable, infectious melodies, be it the glitzy symphonic pop of Rubber Ballz, the lush psychedelia of Fantasy Island, the sharp, twee pop-rock of Million Things or any of the other half-a-dozen avenues taken over the course of this album. Coupled with the scrubbed-clean production and Mercer’s equable vocals, and Heartworms reveals itself as an album that’s consistently lush sonically, even if interest does begin to wane in the final third. The Beatles-style psychedelic pop of the title track is decent enough, but So Now What and The Fear serve as a particularly disappointing note to end on, the latter especially which descends into formless cascades of strings that struggle to have any lasting effect. But beyond that, Heartworms does a fine job of remaining memorable and catchy without sanding off any of its quirkier edges, something that a lot of bands of The Shins’ ilk often fail to do. It helps that the lyrics fit a similar mould too; there’s that same verbosity and wordy imagery that many cult indie acts have co-opted, but Mercer’s usage never feels impenetrable, and the human heart underneath is clearly present as opposed to aloof, overly pretentious poetry. Even written from the perspective of one of the scene’s elder statesmen, there’s still levity that comes from nostalgic yearning, from the desire to revert back to childhood innocence on Fantasy Island and reminiscing on formative adolescent memories on Mildenhall to the acknowledgement of the pressure that comes from being such a figurehead on Million Things. But it’s because of that lightness of touch that Heartworms never feels jaded or crotchety, rather looking on an idealised past with fondness but also acceptance that it’s passed, which is definitely a refreshing take. But even away from that, on a basic fundamental level, Heartworms is an engaging, unimposing listen that never feels the need to be flashy to make an impression. Even if its eclecticism is out of scatter-brained desire rather than necessity, the retention of its soft, listenable formula means that the shifts never jar, even if it does end in more of a whimper than a bang. Regardless, it’s another winner for The Shins that’ll probably go unnoticed by everyone out of the loop, but really, it’s their loss. 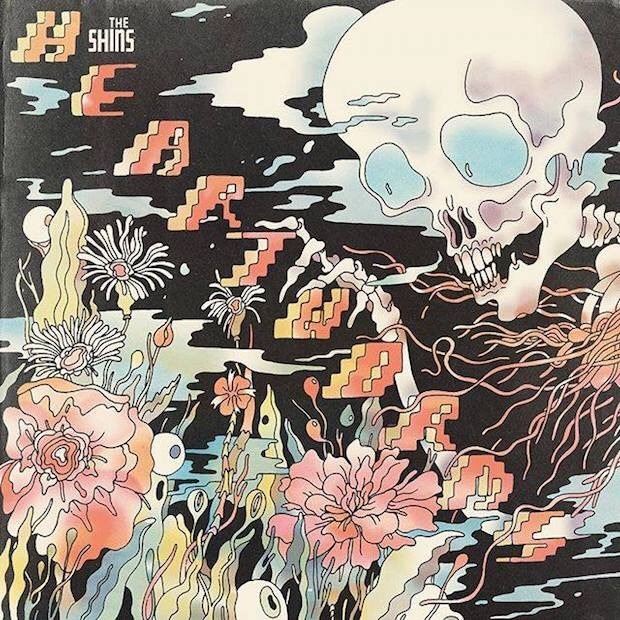 ‘Heartworms’ by The Shins is out now on Audio Apothecary / Columbia Records.